If one needed any more proof of how ridiculous and out of hand the Lunada Bay “localism” situation has become, here you go. On one hand, we have grown adults that bully, threaten and torment unrecognized faces. Ridiculous. And on the other hand, we have actual public servants and resources that have been dedicated to trying to get the Bay Boys to act like, well, actual adults. Equally ridiculous. The latest news from the Palos Verdes Peninsula reveals that a sting operation was planned for February 2016, but was called off when somebody tipped off the Bay Boys. 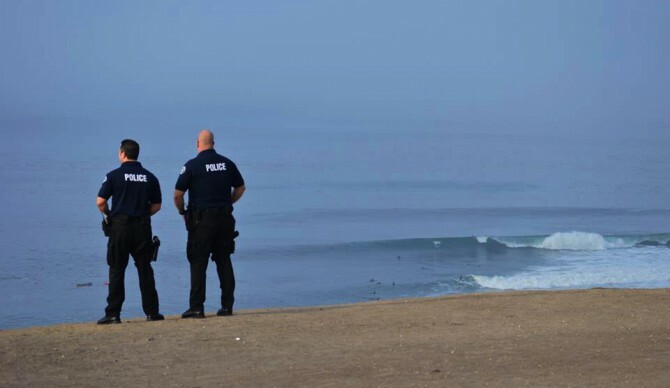 I’m pretty sure the last time a cop went undercover to bust surfers he ended up walking down the Manhattan Beach pier with a neon funboard. Of course, Johnny Utah was hoping to thwart murderous bank robbers – some real serious stuff. This sting was set up to make sure real live people could start being nice to one another. Tax dollars. So there we have it, the situation at Lunada Bay and the lawsuits that have made it all a national story (and embarrassment) now have one major commonality with Point Break. The only difference is that Point Break was incredibly cool. As a side note from the Breeze’s story, court documents also revealed that an estimated $50 million has been lost to the city from access to the wave being cut off to most surfers since 1970. Philip King, an economics professor at San Francisco State University, measures the economic recreational value of beaches for the California Coastal Commission. He estimated that as many as 75 surfers should be paddling out at Lunada Bay on a given day, while the Bay Boys have managed to keep that number down to about a dozen through the decades. Truthfully, few surfers would ever complain about having 85% fewer bodies to compete with at their favorite wave, but $50 million is at least 2.4 houses in Palos Verdes dollars, so I imagine authorities now have an incentive to keep the ridiculousness that is Lunada Bay under control.